The Canon XL1S replaces the XL1, which is now out of production. Outwardly, the XL1S is almost identical to the XL1 except for the function and labeling of a few buttons on the camera body. Inside, however, it's an entirely new camcorder with all new circuits and components. Canon has changed or added many features in order to meet market demand and to incorporate technolgy which was not previously available. The XL1S may be considered as an "improvement" or an "upgrade" to the succesful XL1 design of late 1997. Canon elected to retain the previous XL1 body design, and this is highly beneficial to both end-users and third-party accessory manufacturers. For end-users who are already invested in the wide range of XL1 accessories, the XL1S is completely backward-compatible with them (plus, the older XL1 is forward-compatible with the new XL lenses and other XL1S accessories). Third-party accessory manufacturers will take comfort in the fact that their XL1 add-on products do not have to be altered or re-engineered to fit the XL1S. At the time of this writing, I have not seen or used the XL1S for myself and user reports will not become available until the camera is released to the market. However, recently I got to spend some time on the phone with Joe Bogacz, Senior Product Development Manager for Canon USA's Video Division, and we discussed most of the new features of the XL1S in a little greater detail than what you'll find in the press release. Higher Resolution and Better Low Light Performance -- the CCD block in the XL1 is new. The 1/3rd inch chips have 270,000 pixels (with Frame Movie mode and Pixel Shift process) to match the look of the XL1, but these new CCD's in the XL1S have a signal-to-noise ratio improved by 4db over the XL1. I haven't seen it, but the increase in image quality over the XL1 is said to be noticeable immediately. Interval Recording -- The XL1S sports a new tape transport chassis which supports interval recording. The intervalometer is said to be a vast improvement over the old Canon Hi-8 A1, L1 and L2 cameras. There are four recording intervals (30 sec., 60 sec., 5 min. and 10 min.) and four recording times (15 frames, 30 frames, 45 frames and 60 frames) for a total of 16 different interval recording combinations. Clear Scan -- For shooting computer monitor screens; from a range of 61.9Hz to 201.5 Hz in over 100 separate steps. SMPTE Color Bars -- the real thing this time; no secret trick required to turn them on, either. VCR Stop -- Defeats the 5 minute automatic shut-down. Preset Zoom Speeds -- on both zoom rockers at the side hand grip and the top handle. The hand grip rocker can be set to variable, low, medium and high; while the top handle rocker can be set to slow, medium and fast, as on the GL1. This is a very good idea for handheld shooting, but in my opinion you're still better off with a remote lens controller mounted on the tripod pan handle. CHAR REC -- this option burns the EVF counter data year, (month, day, hour, minute and second) into the video image, useful for some applications such as legal depositions. INDEX REC -- flags a shot as good for fast reference later; the wireless remote has a "find good shot" button which searches for this mark and forwards the tape to that spot, similar to the way it finds the next still image when pressing the "photo search" button. You can also search for video by the date it was recorded. Variable Zebra -- the optional zebra pattern which tells you which areas of your image are overexposed can now be adjusted to one of five IRE levels (choose from 80, 85, 90, 95 or 100% IRE). EVF Display Modes -- you now have the option of turning off all display information in the EVF. I have not yet determined whether or not this includes the "no tape" or "no lens" warnings... pretty sure it does. EVF Color/Black and White -- according to the XL1S instruction manual, you now have the option of turning off the color information in the EVF, converting it into a black and white LCD display. This is not as good as the more expensive B&W CRT viewfinder, but some shooters may prefer B&W in the LCD display instead of full color. EVF 16:9 Electronic Guides -- when selected, these appear in the viewfinder when shooting in normal 4:3 mode so that you may properly crop for 16:9 later in post. These guides are not recorded to tape. 16:9 mode itself has not changed, and the 16:9 image is still "squished" in the viewfinder. Image Adjustments -- similar to the GL1, you can now adjust certain image settings to your precise shooting requirements; such as Color Shift (toward red or toward green), Picture Sharpness, Color Gain (no color to full color), and Black Level (for shadow details). All settings are adjustable through a range of plus or minus 6 steps. Electronic Gain -- two additional gain settings, +18dB and +30dB, are now available. I'm told that thanks to the improved S/N ratio of the new CCD block, the +18db setting is just as clean as the +12db setting on the XL1. The +30db setting does introduce some noticeable noise, but is useful for shooting in almost totally dark environments. White Balance -- there are now three manual settings which can be stored in memory and recalled when desired. Audio Dub and AV Insert -- audio dubbing is available in 12-bit audio recording mode. Video insert is available in the SP recording speed. Analog Video Input -- through both the S-video and RCA composite video jacks, a feature which was missing on the XL1 due to the political climate of the recording industry back in 1997 when that camera was designed. Custom Keys and Presets -- Certain camera and VCR mode functions can be programmed into these two buttons for immediate access when desired. A little confusing, but a fascinating feature which I'm looking forward to exploring in greater detail someday. Three Picture Memories -- If I understand this properly, you can configure three separate combinations of custom image settings (such as a black and white image, for example) and hold these settings in memory for later recall. Low Power Consumption -- with the installation of entirely new, more efficient internal components, the XL1S has a significantly lower power requirement than the XL1, which comparably improves battery life. Expect almost two hours from the standard BP-930 and almost three hours from the BP-945. Easy menu system -- the iris wheel now doubles as the internal menu item selector and can be pushed to choose an item, which is a vast improvement over the old four-button menu system. The menu itself is accessed by a new botton on the camera body below the red sliding door. DV Control -- sends REC and REC PAUSE signals through the DV cable to an external IEEE1394 device. This can be another DV camcorder (such as an inexpensive Canon ZR10), a DV deck, or an external field-portable FireWire hardrive. 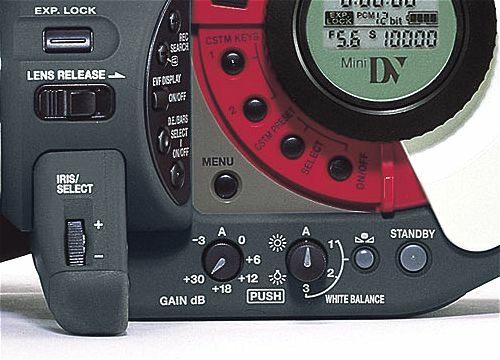 Pausing and recording on the XL1S is duplicated on the other DV device, producing an exact copy on the spot, with identical timecode. Keeping one copy pristine, and using the other for logging purposes, is one application for this feature. Frame Movie mode is not changed from the previous XL1. 16:9 recording mode is not changed. The microphone and EVF assembly is not changed (except for the new EVF features mentioned above); however I've been told there is a very slight but important physical difference: the EVF and mic cables are supposed to be slightly longer to better accomodate the LightWave Systems audio accessories without strain. Let's hope this is true! I can't speak for Europe or anywhere else in the world, but within the U.S. market, the official word from Canon USA is late August for the XL1S kit, complete with body and lens. However, it's my understanding that authorized dealers will be receiving inventory in late July, not August. The MSRP for the kit is the same as the standard XL1, at $4700, with "street prices" from some reputable, authorized dealers being perhaps slightly lower. The contents of the XL1S kit are the same as before; it's a complete package with everything you need, including a DV tape, battery, wireless remote, etc. Later in October, Canon USA will offer (through authorized dealers, of course) the body alone, for $3300 MSRP. This option does not include a lens or viewfinder, allowing you to select your own. It is unclear to me whether the microphone is included in this package. However, the power supply, wireless remote, etc. will all be included in the Body Only kit. The new "IS II" 16x automatic lens (with optical image stabilization) which ships with the XL1S kit will be available separately for purchase, and is backward-compatible with the XL1. I do not know the availability date. The price should be less than $1800. More information about this lens follows below. The new 16x manual lens (with a marked barrel and motor zoom) will be available separately for purchase, and is backward-compatible with the XL1. The availability date is sometime in November. The price should be around $1800. More information about this lens follows below. The new MA-200 shoulder support/XLR audio adapter (with four XLR inputs) is also backward-compatible with the XL1. I do not know the availability date, but believe it will be sometime in November. The price should be around $500. More information about the MA-200 follows below. As previously stated, the former XL1 model out of production. Canon USA has told me that some authorized dealers will be selling older, refurbished XL1 cameras at a significantly reduced price (more information on that as it becomes available). Unfortunately, there will be no trade-in or upgrade allowance to move from the XL1 to the XL1S. Also, it is not possible to have an existing XL1 altered or otherwise modified into an XL1S. The changes involved go far beyond software and include all internal circuitry and hardware. Besides, the cost of individual replacement of some or all physical components would far exceed the cost of simply buying the new camera. At this point in time, XL1 owners looking to buy into the XL1S are encouraged to either keep their older XL1 for a second camera, or sell it individually on the private market. See Canon USA's published specifications for the XL1S. Download the XL1S Instruction Manual from Canon USA's Manual Library. This is an Adobe Acrobat .PDF file, about 3.85 megabytes. Included in the basic XL1S kit (and available for separate purchase) is the new IS II 16x automatic lens. Outwardly it looks identical to the previous XL1 16x lens, but inside is a new design which reportedly is a significant improvement over the earlier 16x automatic lens. The new IS II lens is backward-compatible with the older XL1, and like its predecessor, it includes a neutral density filter, a maunal/auto focus switch, and Canon's superb Optical Image Stabilization technology. A new 16x manual lens will be available separately in November. Outwardly this lens appears similar to the previous 14x manual lens (which it replaces) in that it has a black barrel marked with focus, zoom and aperature numbers. This lens has a rectangular lens hood instead of the round one found on the older 14x. However, the primary difference between that lens and this new manual lens (other than the longer focal length of 16x) is a motor for zoom control from the grip, plus automatic iris control and two built-in neutral density filter settings (2.7 and 5). 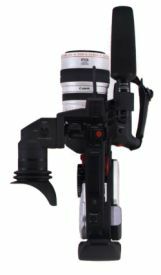 This lens may be operated in full manual mode, or with motorized zooming from both the grip handle and the LANC jack with a remote zoom controller. There is no automatic focus on this lens; it is manual focus only. It does not have image stabilization. This is not an "internal focus" lens; however, the front element does not rotate, which means clamp-on matte boxes may be used with ease. The 16x manual lens is of course backward-compatible with the older XL1. This is a newer, larger, improved version of the MA-100 which sports a bigger shoulder rest and four XLR audio inputs. It's supposed to improve shoulder-mount balance significantly. The included mounting bracket for wireless mics, batteries, etc. is on a pair of telescoping rods which pull out to accomodate accessory size and balance. There's also a BNC composite video output jack. Currently I don't have any other technical info except that it's backward-compatible with the older XL1. 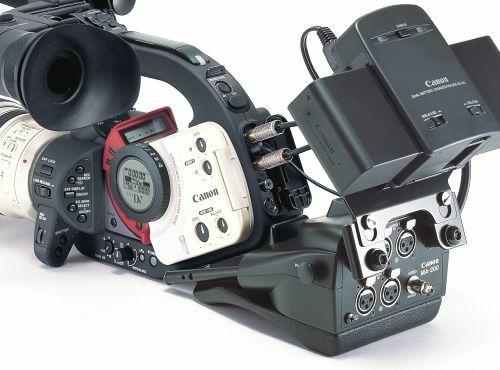 My understanding is that the same person who designed the MA-100 for Canon also did the new MA-200. I went over to to the MacWorld tradeshow yesterday, specifically to get my hands on a new XL1S. Since you mentioned on your site for people to let you know if they did this, I am. I "reviewed" the camera for a professional filmmaker's mailing list that I am on, and so I've pasted what I typed there. The reps gave me a lot of info. Some of the stuff below is repeats of what Canon has on their website, but they were features that I especially liked. There were three XL1S's out for people to play with, and one displayed inside a lucite case (with the 3D lens prototype mounted, and surrounded by accessories, including the new manual focus motor zoom lens). Among the three demos, one had the pro viewfinder and Canon full manual lens, one had the stock lens and viewfinder, but a few extra aftermarket accessories on it (like a viewfinder isolator and microphone fuzzy), and the third one (which I did not mess with) was bone-stock. The two I played with both had the new MA-200 shoulder mount adapter. Image quality is indeed much improved over the XL1. The image is much more crisp in appearance. In addition, the rep told me that the camera now gives the operator complete control over black level, control over color level, and control over picture sharpness. I did not have an opportunity to really try any of this out, but it sounds promising. The video noise introduced at different levels of gain is also much improved over the XL1, plus the new camera has the +30dB setting. At +30dB, the noise level was actually better than I remember my AJ-D700 DVCPRO news camera being at the same level. The settings now are +6, +12, +18, and +30. There are also the -3, auto, and 0dB choices. There are now several new additions to the white balance switch. There is 3200k preset, 5600k preset, auto, and three manual settings. You can set three white balance settings and switch rapidly between them if your situation warrants it (shooting indoors and outdoors in a walking shot, for instance). Now, instead of accessing the menu through the little buttons under the sliding door, you hit the menu button and then scroll through with the iris wheel. You select your choices by depressing the iris wheel. This makes it easy to change menu settings without ever taking your eye from the viewfinder. Also under the red door, there are now two custom preset buttons. You can assign particular camera setups to each one and rapidly switch between them without having to go through the menu. The MA-200 adapter is much wider, and does make shouldering the camera more comfortable. But, the camera is still front-heavy, and even with the sliding balance rods on the MA-200, the weight of the dual battery holder and two BP930's (what they had on the demos) was not enough to make the camera feel balanced. The MA-200 has the new sliding mounting plate for accessories, plus it retains the 3-fastener mounting point for any custom MA-100 accessories. The new 16x standard zoom seemed to follow my hand much faster when I snapped focus or zoom. I still would prefer a full manual zoom (or manual focus/iris with a deselectable zoom motor, like the new pro lens). -- submitted by Matt Ray. DV control is great. It actually works. Allows a slave deck to be controlled by the camera. Personally I love the new 30db gain feature as I do reality shoots at night using ambient light. The 16:9 guide in the viewfinder is great for composing your shot in a 4:3 space with the possibility of displaying on a 16:9 monitor. Now we can all shoot the roses going into bloom by using the "Interval Recording' feature. The "ClearScan" feature was not enabled on this prototype demo unit. New SMPTE color bars... now I can use the vectorscope in Final Cut Pro. I love the "Power Save" feature as I often shoot with a switcher and had to leave the tape out or the tape bay open to keep the XL1 from shutting down. The permanent window burn is nice for Legal Videographers. Assuming we get a good shot we can now mark it with an "Index Mark". Variable Zebra is neat but will take some practice to get tuned into. "Picture Adjustments" combined with "User Presets" will come in handy for adjusting to other camcorders such as Sony in a multi camera shoot. Three white balance presets. What a luxury! Audio dub is going to be useful for doing things like field voice over or add on music tracks when they need to view the video simultaneously. Four XLR inputs... now that is pure extravagance. AV inserts were frame accurate. We will experiment further with that one. The menu is easy... hey, it feels like a Sony! The picture quality of the XL1S was better than with the XL1. It's a subjective statement that the eye of the beholder will need to prove. The XL1 or the XL1s does not handle high contrast lighting as well as other camcorders such as the Sony DSR-PD150 or the DSR-250 for example. The new lens seems more solid and we did not experience "jumps" during zooming. -- submitted by Larry Kausch - ProMax Instructor, Support, and Demo Artist. As the XL1S becomes available for purchase and begins to penetrate the prosumer DV camcorder marketplace, I intend to follow its usage as I have done for the past three and one-half years for the XL1. As owner's reports and helpful operational articles are submitted, I'll publish them here. Since the Watchdog launched along with the original XL1 back in early January 1998, it has accumulated more than 100 pages of content and is the largest online resource of its kind in the world. With your readership and participation, I expect it will only continue to improve and grow as the XL1S is used and written about in the many months to come. Stay tuned! Lots more is on the way. You've got a suggestion that will make this page better? Tell me about it! Please direct questions to the DV Info Net Community Forums. Please support this site by making your purchases through them. Thanks! Welcome what you can't avoid.